Jerome Kern’s “Show Boat” opens this weekend for a run of five performances from May 1 through May 9 at Keller Auditorium. Produced by Portland Opera, the music will not be amplified but spoken text will. 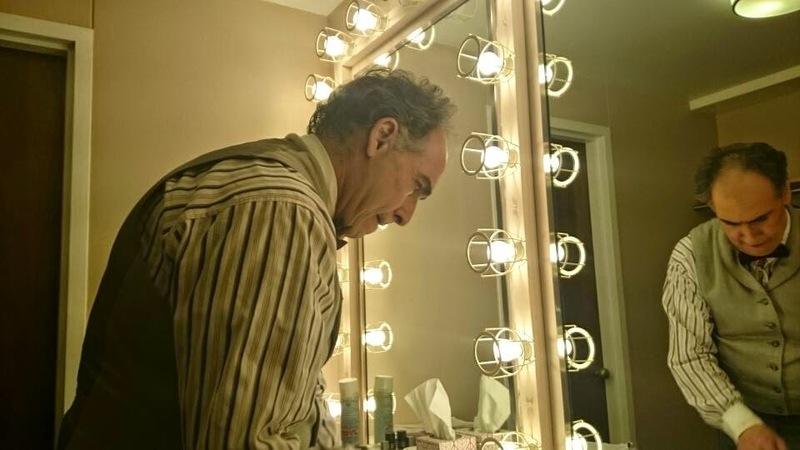 Hal France, who has conducted productions of “Macbeth” (2005) and “Turandot” (2003), returns to Portland Opera to lead the orchestra and singers. What got you into conducting? France: I started out as a rehearsal accompanist and decided to work my way up. So I went to school, the University Of Cincinnati College Conservatory Of Music to study orchestral conducting, and I worked in opera throughout that whole time. How does conducting a musical differ from conducting opera? France: Almost every American musical reflects a wide variety of musical styles. Some is more dance-oriented and some is oriented toward pop music. American musicals often delve into the vernacular like folk music and jazz or blues. “Show Boat” has a little bit of all of that in it. As a conductor you have to be comfortable with that. An opera background prepares you very well for “Show Boat” – provided that you like all of the different musical styles. A certain part of “Show Boat” is very legitimate opera, but it’s very familiar too because it is based on American popular music. France: I like the variety. For me, the connective tissue is musical storytelling, which I really love. I did a play last year. That is, I played the piano and the role of Beethoven in the theater piece “33 Variations.” It is all about telling a story musically. In “Show Boat,” the orchestra contributes a great deal to the atmosphere, which starts out as a story about show business people at a certain time in history. One of the serious themes in “Show Boat” deals with a multi-racial woman, and where she works causes a great deal of difficulty. The orchestra comments more on that than almost anything else. The music we play during that very dramatic scene, “the miscegenation scene,” is some of the best music of the show. I have never seen the conductor’s score for a musical. Are the words for the spoken parts just written into the score? France: Once a piece achieves a certain level of notoriety, efforts are made to create a score that can be utilized and answer those questions. “Show Boat” is interesting because it was created almost 90 years ago. The premiere was in 1927. It was produced during different eras and as a result has had a lot of changes, like the songs that were added from the film versions. The original score had a lot of songs that didn’t make it through the try-outs and were eliminated in the final cut. There are songs in the score that have long since been gone. So “Show Boat” has been a hard piece for anybody to wrap their hands around in order to make a definitive version. For the show at Portland Opera, we are basing our version on one that was done in the 1990s by Hal Prince. It was greatly influenced by music that had been re-earthed – not rediscovered – by a John McGlinn, who had an incredible love for “Show Boat.” In the 1980s McGlinn found all of the original stuff and the original orchestrations, which were different in the 1920s than in the 1940s. It was much more European in the 1920s. What people heard was less jazz-influenced and more classical-influenced. In any case, McGlinn made a complete recording of all of the music of “Show Boat,” and that recording is still available. It’s about four hours of music. That recording influenced the Broadway revival under Hal Prince in the 1990s. Prince had his team work at creating a new version that included a lot of the old music. I wanted to use that version for our production in Portland, because it included a lot of songs like “Misery” and “Room above Her,” which were pieces that had been cut out of the standard version. France: No. This is a very lucrative product. The property is owned by Rogers and Hammerstein, and they keep it under wraps. There is no orchestral score of “Show Boat” available for purchase. Everything is rental. Broadway conductors are expected to conduct from the piano score rather than from the orchestral score. For “Show Boat,” this is a disaster because it is such an orchestral piece. I learned through a friend who worked with Hal Prince, that you could rent an orchestral score on a weekly basis. So I did that, because I had the devil of a time trying to use the piano score to figure out what was happening in the 40-piece orchestra. The piano score almost tells you nothing. So when you rent an orchestra score for the Portland Opera production, what happens if you write some notes in it in pencil? Do you have to erase all of your instructions? France: The version that we are doing here in Portland has a lot of changes, and the team of people here at Portland Opera are going to have to undo all of my notes before they send it back. It will be very clean and nice before it returns. The Hal Prince version that we are basing our production was a lavish one that included a lot of dancers. But opera companies don’t typically invest a lot of dancers. So we are not doing those dance numbers, which had a big scenic element. Ours is more streamlined and focus on the development of the characters and not so much on spectacle. “Misery” is the reason that I love this version of “Show Boat.” It may have been considered too risky by the original producers, because it was a little too sad. Kern considered it one of the best songs that he ever wrote. He used throughout the underscoring of the piece. You can hear it all the way through the miscegenation scene. It’s a number for Queenie and Chorus I. It is done as a prelude to the real turn in the plot that something bad is going to happen. The orchestra is on stage for this production. You will see four different levels of a Mississippi boat on stage and the orchestra will be visible on stage. I will conduct from the stage in full costume because I will be Jake the piano player. Jake plays at the Trocadero. And I will be the piano player of the boat. He doesn’t have a name. So I get to wear a costume and I have lines to speak! Violinist Karen Gomyo teamed up with the Oregon Symphony under guest conductor Gilbert Varga to deliver a stellar performance of Mendelssohn’s Violin Concerto on Saturday evening (April 25) at the Arlene Schnitzer Concert Hall. The program, which included the Second Symphony of Brahms and the Second Symphony of Haydn, proved to be popular choice, because there were few empty seats to be seen anywhere in the hall. Gomyo is no stranger to Portland. The 33-year-old virtuoso gave thrilling performances with the orchestra in 2010 (Prokofiev’s First Violin Concerto) and 2011 (Beethoven’s Violin Concerto). This time around, she created a spellbinding rendition of Mendelssohn’s Violin Concerto. She impeccably articulated notes and phrases even when they flowed at a lickety split pace. She caressed the melodies in the “Andante” (second movement) so that they blossomed with genuine elegance and nobility. Overall, her playing showed passion and revealed insight into this masterpiece, and the orchestra expertly followed Varga’s direction and made sure that Gomyo’s Strad could be heard during the softest and loudest passages. An eager audience listened to Gomyo with rapt attention. Gomyo drew an incredibly enthusiastic response from the all corners of the hall and by the time she came out on stage for her fourth bow, she decided to do an encore, which was a tango by Ástor Piazzolla, which featured rhythmical challenges with deceptive stutter steps and off-beat accents. Varga displayed a graceful, poetic conducting style that he used to great advantage during the Brahms. The orchestra sounded very well balanced throughout the piece, and it was terrific to hear various sections come out strongly whenever they had the leading line. The strings maintained a fresh and lovely tone throughout, even when Varga urged them on a breakneck speed. The golden tone of the cello section during the second movement was exceptional, and the woodwinds against the pizzicatos of the cellos in the third movement became one of the highlights of the evening. Except for one brief bobble, John Cox, principal French horn, created panoply of marvelous sounds, as did Martin Hébert, principal oboist. At the conclusion of this work, Varga waded into the orchestra to congratulate and shake the hands of many orchestra members. The concert began with Haydn’s Symphony No. 2, one of Haydn’s early and short works. A mere ten minutes in length, this work featured the lithe and ultra clean sound of the strings. The second movement with its sinewy phrases was particularly engaging. Varga encouraged the orchestra to play with commitment, and it responded ardently. Varga impressively conducted the Haydn and Brahms from memory. For the Mendelssohn, he had a reduced score (or a piano version) on his music stand, but he never bothered to open it. Final note: I didn’t get the name of the guest principal flutist, who did a fine job, but could have played a little louder at times. Some audience members speculated that the orchestra's principal flutist is ill. I don't know anything about that, but I will try to find out. Post Post Script: Jim Fullan of the OSO stated that the principal flutist was Jeffrey Barker, who is the principal flutist of the Boise Philharmonic. Fullan also said that Sindell is "out on leave." 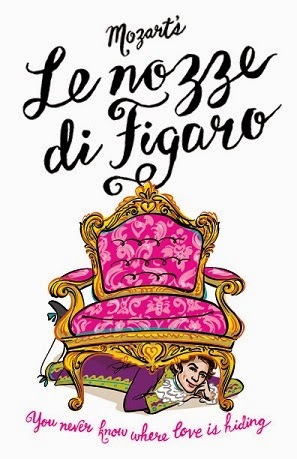 Portland State University opened its 2015 opera, Mozart's Le Nozze di Figaro, on Friday, April 17 at the Lincoln Hall on the PSU campus. A marvelous venue since it's renovation in 2010, it was a perfect showcase for this beloved work. PSU has long been known for its spectacular student operas, and this year's was no different. The orchestra under Ari Pelto hit the ground running with the famous overture, its tempo brisk and lines clean. The set was traditional, set in the late 1700s and included a sweeping colonnade that served as a backdrop for many scenes, including a dimly lit, mystical garden in the second half. The costumes were rich and detailed, providing another important element for an evening that felt like one had moved back in time to Herr Mozart's day. Hannah Consenz's Susanna was spectacular--fine singing, clear, concise diction, and a seeming intuition for the demands of the soubrette were hallmarks of her performance. The opening scene with her and Darian Hutchinson as Figaro left no doubt that the PSU opera group was up to the task. Hutchinson was an affable Figaro and he too sang beautifully. There was charisma and chemistry between him and his affianced, and throughout the performance Hutchinson's portrayal of a Figaro with effortless confidence imparted to the audience his belief that no matter what the circumstance, things would turn out all right for Figaro. Jonathan Roberts as Bartolo and Hanaa El-warari as Marcellina were also enjoyable; Roberts has a clean, easily-projecting baritone. Anna Patterson's Cherubino was a special treat, not just for the knack for physical comedy she displayed, but also for some nuanced singing. Alexandra Saori Erickson's Countess Almaviva was extremely impressive. Erickson has a very powerful voice; in some instances it pushed being too powerful. As a listener I would've traded some heft for a more delicate touch in her first aria, but by the time she sang E Susanna, non vien she had settled in and delivered a rich, inviting aria, vocally balanced and emotionally true. Of special note too were her duets with Consenz; they blended two very different vocal types seamlessly, and the end result was delicious to hear. In all the performance displayed the traits that audiences have come to expect from PSU's opera program under the hand of Christine Meadows; that is to say professionalism, poise and an outstanding final product. Every spring for the past 22 years, the Vancouver Symphony has rewarded the winners of its Young Artist Competition with the opportunity to solo with the orchestra on it classical series. At this year’s concert, which took place yesterday afternoon (April 18), a earnest audience shunned the unseasonably sunny weather outside to hear violinist Yun Teng, and pianists Matthieu Galizia and Nathan Kim perform at Skyview Concert Hall. All three teenagers delivered outstanding performances with Kim’s playing of Sergei Prokofiev’s First Piano Concerto shining the brightest. Kim, a 15-year-old freshman at Newberg High School (Newberg, Oregon) has already won a number of prestigious competitions that have allowed him to play at Carnegie Hall and a month ago soloed with the Coeur d’Alene Symphony after winning its young artist competition. He came on stage with a lot of confidence and unleashed a passionate and precise performance of the Prokofiev concerto. Glancing up now and then to make sure that he was in sync with conductor Salvador Brotons, Kim brought out the mercurial nature of the music, which ranged from bold statements to quiet and solemn excursions. Galizia, a 16-year-old homeschooled student from St. Helens, Oregon, has also won several competitions, and this was his first appearance with an orchestra. He played the first movement of Edvard Grieg’s Piano Concerto with confidence and remarkable expression, but he was not always lined up exactly with orchestra. His best and most expressive playing came during the cadenza. At that point, he coaxed gorgeously sensitive phrases and a made the piece his own. Equally impressive was Teng’s ardent performance of the first movement of Jean Sibelius’s Violin Concerto. The 17-year-old senior from Camas High School (Camas, Washington), is also young veteran of competitions and has soloed in Carnegie Hall and with the Willamette Falls Symphony and the Clark College Orchestra. He created searing lines with a beautiful, resonant tone that carried well above the orchestra. Even though the frenzied passage just before the end of the piece veered a little off the rails, Teng kept his composure and applied a silky sound to the finish. After intermission the orchestra performed Arthur Honegger’s Fifth Symphony, which is known as “Di tre re” (“Of the three D’s”) because of the Ds that are played by the low strings and the timpani at the end of each movement. The orchestra gave this rarely heard gem a stirring performance. The crescendos into the wildest parts of this piece were thrilling with the French horn contributing mightily. The motoric sound of the third movement had a lot of verve and the lower strings established a tick-tock kind of fate as the piece came to a close. Biting accents by the trombones, sporadic commentary by the woodwinds, and a mysterious atmosphere created by the strings were some of the highlights of this piece. The concert concluded with a spirited performance of Maurice Ravel’s “La Valse” (The Waltz”). Brotons, conducting from memory, urged the orchestra to fashion a dance that would spin out of control. It didn’t seem to quite get there, but the music still had a wonderful collapse that sent the audience out into the bright sunshine with a smile. An evening of some worthy, but somewhat unknown, music was presented by Carlos Kalmar and the Oregon Symphony with guest pianist Jean-Philippe Collard last Sunday (April 12) at the Arlene Schnitzer Concert Hall. Two of the pieces were Portland debuts and two were among the last works of their composers. What could well have been a melancholy experience was anything but: the "Slavonic Dances," Op. 72, of Antonín Dvořák would keep any listener wide awake and free of any sadness! And nineteen minutes of brooding, savage-sounding music aligned itself perfectly with this poetry. Musically, I could not help but think that "ensemble" was the watchword of this piece; the work in the woodwinds was especially commendable. It was unfortunate that Sibelius wrote (or at least published) nothing after "Tapiola" which was composed in 1926. He lived for a long time in severe depression and spoke little about his music in his last years. Jean-Philippe Collard, French pianist, came onstage to play Béla Bartók's Third Piano Concerto. I remember hearing this work as a young college student when I purchased a record of two of Bartók's concerti. Impressed by their grittiness, but knowing very little about music at that time, just that I was fascinated by "modern" music, I remember playing the record often and always being held in awe. Bartók was a sad man: suffering many losses and having to escape from his native Hungary when it was overtaken by the Nazis. He found a new home in the U.S. but his music did not have much popularity here and he worked mainly on commissions to earn money. Like Sibelius, he suffered from depression and was diagnosed with leukemia in 1942. His “Concerto for Orchestra,” probably his most famous composition, arose out of this time. The cancer was in remission by the summer of 1945 and Bartók and his wife Ditta, a pianist, lived for awhile in Asheville, North Carolina. He wrote the concerto for her as a birthday surprise. However, his health worsened and he returned to New York, managing to finish this concerto four days before he died. Although I used the word "grittiness" earlier, this concerto rather gives the lie to that as it is playful, lilting, and whimsical. The middle movement Adagio religioso is an excellent mixture of what sounds like Appalachian folk music, hymns, and bird-calls. For one who considered himself an atheist, perhaps this signaled a turn in Bartók outlook. Everything described here was expertly manifested by Collard. At 67, he plays deftly and attentively, occasionally using a score for reference. (It was noted that he would turn two or three pages at a time.) The aforementioned middle movement, which is really central to the whole piece, was executed sensitively. It was enthralling. I would like sometime to hear Collard play the middle movement (indeed all of the work) of Ravel's piano concerto, which is similar in scope. A complete change of mood took place in the second part of the evening's program. Antonín Dvořák's second set of "Slavonic Dances" was given a lively, playful reading by the orchestra. It would have been helpful to have an English translation of the titles of each dance, but with some help I found that Starodávný, the title of the second and sixth dances, means "of yore"; Špačírka means "walking" (fifth dance); Kolo is "round" (seventh dance); and Sousedská is "vicinal" ("neighborly," the eighth dance). The eight dances range from delicate to sweeping, brooding to bold, carnival-like and brash to contemplative. The varied tempi provide and hold interest, but at times a few messy entrances, especially in the brass, distracted this listener. Dvořák had composed a popular first set of dances and his publisher Simrock wanted a second set, but the composer demurred: "You will forgive me but I simply have not the slightest inclination now to think of such light music." But he did not simply dash off quickly these lively dances but gave them his best craft and skill. Dvořák was mainly interested in larger-scale works but Simrock insisted that he produce more dances and paid well for them. It's what "sells" that counts, then (1886) as now, we suppose. Both the Sibelius and the Dvořák works were OSO premiere performances, and it is hoped they will be played and heard again. Andrew Porter passed way yesterday at the age of 86 in London. NPR has filed this obituary on Porter, and the New York Times has another, very entertainingly written one, here. I met Porter once in Toronto, Canada, when the Four Seasons Centre for the Performing Arts (home of the Canadian Opera Company) opened in 2006. I was there with a number of my music critic colleagues, and Porter had given a talk related to the Ring Cycle, which was the initial production for the new opera house. Also, I should thank opera critic Mark Mandel for alerting me about Porter's death. 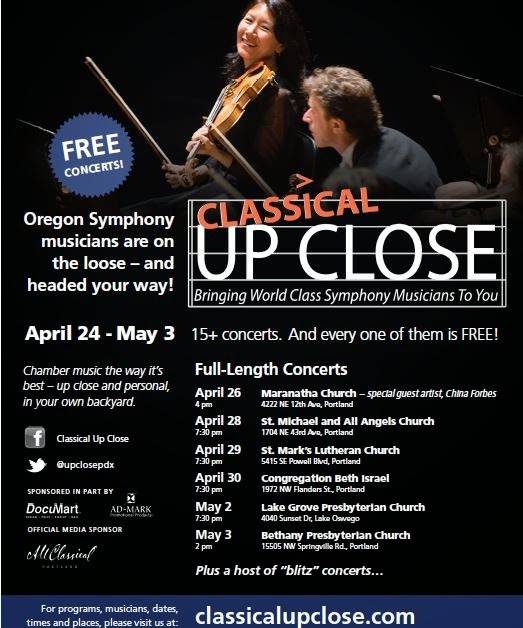 Classical Up Close is bringing world class musicians to Portland neighborhoods with its annual weeklong series of free chamber music performances, where audiences are encouraged to sit onstage with the performers, use social media, ask questions, and applaud freely. The festival centers around six informal, full-length concerts in various locations throughout Greater Portland, including Congregation Beth Israel, St. Mark’s Lutheran, and Lake Grove Presbyterian. Special guests include Pink Martini’s China Forbes, who will sing at Maranatha Church in North Portland on April 26th, 2015. In addition to full-length concerts are several “blitz” performances: 30-minute concerts in unlikely venues, meant to meet people where they live, work, and play. Blitz venues will include American Legion Post #134, Powell’s Books, Meals on Wheels, PDX Playdate, and Beaverton City Library. Classical Up Close was founded in 2013 by a group of Oregon Symphony musicians seeking to celebrate and strengthen their community relationships, thank the symphony’s many supporters, and make new friends, both for the symphony and for classical music. Here is the listing of concerts for April in the Portland metro area that feature new music, as compiled by Bob Priest, composer, impresario, and Mr.MarchMusicModerne. "Cascadia Hits on the World"
Barber & Bernstein's "West Side Story"